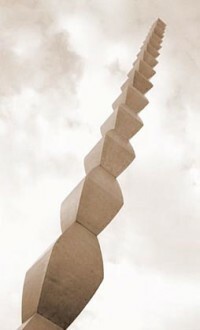 Constantin Brâncuși was born in Hobitza, Romania on February 19, 1876. He studied at the Scoala de Meserii in Craiova (School of Arts and Crafts) from 1894-98 and the Scoala National de Arte Frumoase (National School of Fine Arts) in Bucharest from 1898-1901. He then moved to Paris in 1904 and enrolled in the Ecole des Beaux-Arts the following year. In 1906, one of his sculptures was shown at the Salon d’Automne, where he met fellow sculptor Auguste Rodin. Five of Brâncuși’s sculptures were included in the famous 1913 Armory Show in New York, and Alfred Stieglitz’s 291 New York gallery was the location of his first solo exhibition in 1914. Brâncuși exhibited in Europe and the US for the following years and began traveling extensively in the 1930s. His final sculpture, Grand Coq, was completed in 1949, and he passed away in Paris on March 16, 1957.